Seeking to provide a reliable water supply to its growing population as climate change progresses, Lima, Peru, is looking to the mountains above the city, where centuries-old infrastructure could help provide a solution. In late March, Peru's national water regulator, SUNASS, tentatively approved a plan for Lima's water utility to devote close to 5 percent of its collected fees to climate change adaptation, disaster risk reduction and green infrastructure. Over a five-year period, the regulator estimates that $112 million will be collected for this purpose. SUNASS President Fernando Momiy Hada confirmed in an email that one project under consideration is the refurbishment of ancient structures called amunas, which were built by pre-Incan peoples around the turn of the first millennium. 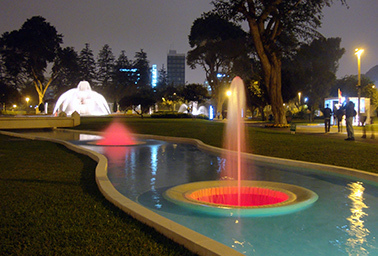 A fountain in downtown Lima, Peru, may soon be fed by water storage conduits designed by pre-Inca engineers. Photo by Miguel Vera León, courtesy of Flickr. Amunas take on several different forms, according to Bert De Bièvre, a Lima-based researcher with nongovernmental organization the Consortium for the Sustainable Development of the Andean Ecoregion (CONDESAN) who has researched the structures. They can look like channels, pools or even walls. Amunas share a single purpose, however. When rain falls, De Bièvre explained, they are designed to prevent the water from flowing immediately downhill, instead funneling it across the sides of the mountains, allowing it to slowly infiltrate the ground. "It resurfaces weeks or months later, when we are running into the dry season," De Bièvre said. This old-school water preservation technique could come in handy for Lima, which is among the world's biggest desert metropolises. 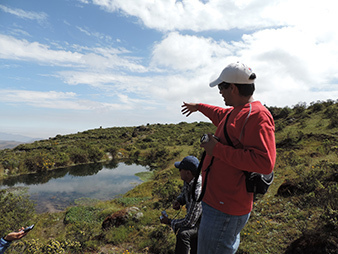 While the city of 9 million receives sufficient precipitation during the December-to-May rainy season, "it's really the function of timing that's the problem," said Gena Gammie, a manager with Forest Trends' Water Initiative, who helped research the potential benefits of amunas restoration for Lima. A water source near Huamantanga, Peru, a community upstream of Lima, where nonprofits are considering early efforts to restore grasslands and ancient water infrastructure called amunas. Photo courtesy Forest Trends. During the dry season, the watersheds that supply the city often run short. According to Forest Trends, a Washington, D.C.-based nonprofit that worked with CONDESAN and others to provide a cost-benefit analysis on green infrastructure, the Lima region copes with a deficit of nearly 43 million cubic meters of water each year. Forest Trends and CONDESAN want Peru to use some of the newly approved green infrastructure funding to regrout the amunas so the structures can carry more water and help provide Lima with water storage to prepare for the dry season. "Compared to more drastic, gray infrastructure, it's a much lighter touch, and it's much more compatible with the natural hydrology," Gammie said. "Gray infrastructure" generally refers to more traditional man-made infrastructure, like water reservoirs and pipes. In an email, SUNASS's Momiy Hada said that funding for amunas restoration has not yet been secured but is under consideration. Momiy Hada added that investing in green infrastructure to protect Lima's water system "is not a matter of feelings or a political position or because it is fashionable." Rather, he said, "the main objective of the investment in green infrastructure is the conservation of quantity and quality of the water." Forest Trends and CONDESAN are also advocating for other "green" solutions to help assure a steady, clean water supply for Lima. For example, cattle farmed in the mountains above the city are also causing problems. "Cattle density is usually too high and also badly managed," De Bièvre said. Because of this, the soil on the mountain slope becomes hard. In Brazil, which was sometimes called the Saudi Arabia of water, a drought is creating a major water supply crisis in São Paulo. Photo by Diego Torres Silvestre, courtesy of Flickr. "Compaction of the soil is one of the worst enemies of hydrological regulations of an ecosystem," De Bièvre explained, because it causes water to flow quickly downhill and leads to erosion. One potential solution is to provide incentives to farmers to raise alpacas instead of cattle, because their feet are cushioned and less prone to compacting the soils, said De Bièvre. Another idea is to erect fences to allow rotational grazing so the natural grasslands can recover. According to De Bièvre, climate change could intensify the seasonality of precipitation in the region, making the water deficits Lima experiences in the dry season "much worse" in the future, he said. But De Bièvre added that the main issue is Lima's population explosion -- the city is predicted to grow beyond 10 million by 2030, according to a recent U.N. report. 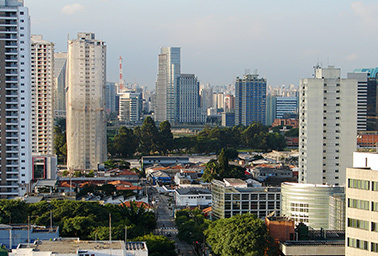 Another major South American city facing simultaneous growth and water problems is São Paulo, Brazil, which experienced serious water shortages over the past year, a crisis that was compounded by poor infrastructure and planning. Some called it "the worst water crisis in history," even though previously Brazil was sometimes called the "Saudi Arabia of water" because of its vast resources (ClimateWire, Jan. 27, 2015). Speaking of the need to ensure a reliable water supply to Lima's citizens as it grows into one of the region's biggest megacities, De Bièvre said, "climate change is just another additional reason that makes it more important, but this will also be necessary without climate change."